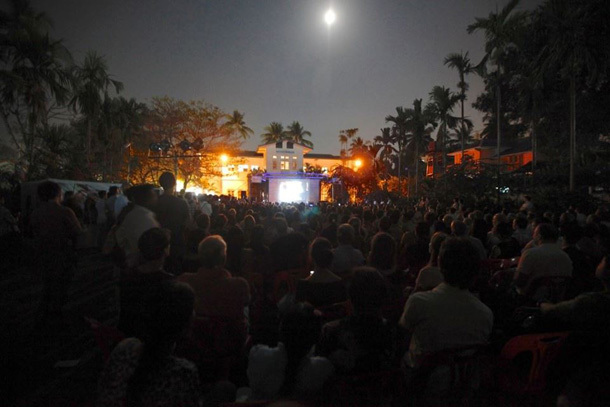 Some of the best work by Burmese photographers will be on show in a garden setting. Prizes will be awarded by a jury presided over by Daw Aung San Suu Kyi, according to the event’s website, and international photo personalities such as Hossein Farmani (Lucie Awards), Hans Silvester and Floris de Bonneville (Gamma). Where: Institut Francais de Birmanie, 340 Pyay Rd, Sanchaung Tsp. When: Saturday, March 19. Time: 6:00 pm. 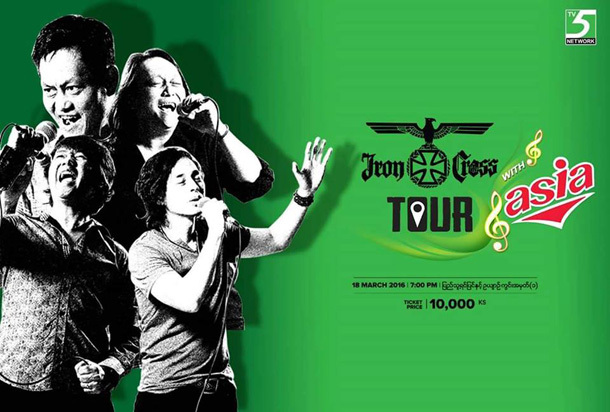 Burmese rock band Iron Cross are back with a show. Tickets are available, according to the band’s Facebook page, at 5 Network Showroom, 4 Digital Main Showroom, The Sun Music Production, 1876 Call Centre, Ko Ko Beauty Salon (Dagon Center). 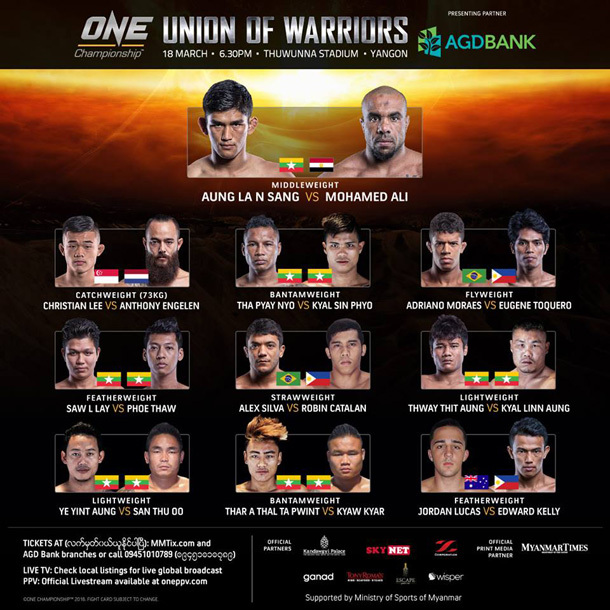 One Championship Union of Warriors will be in Rangoon for a mixed martial arts competition, along with ethnic Kachin fighter Aung La Nsang (Burmese Python) who will face Egyptian striker Mohammad Ali. The event will feature ten bouts of fighting, with competitors from Singapore, the Philippines, Brazil and more. Tickets are available at MMtix.com and branches of AGD Bank. 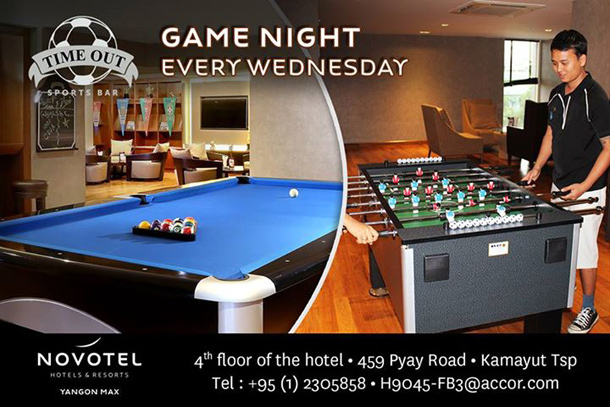 The Novotel hosts tournaments for pool, football and dart players every Wednesday with awards for shots and gift vouchers for winners. 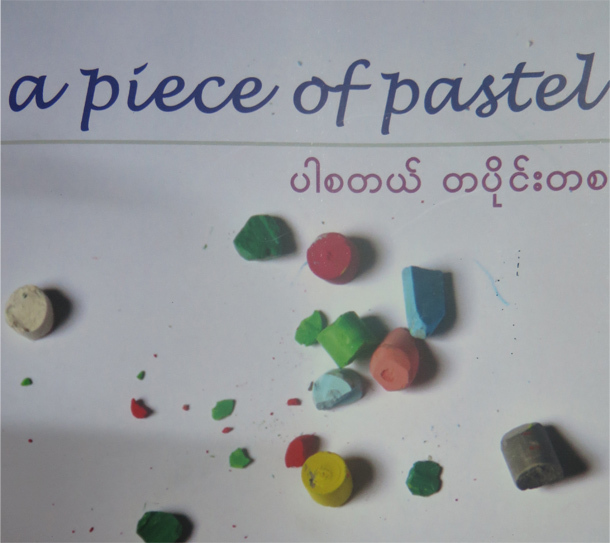 “A piece of pastel” will showcase the works of 12 artists including Win Pe Myint and Bogalay Htay Win. 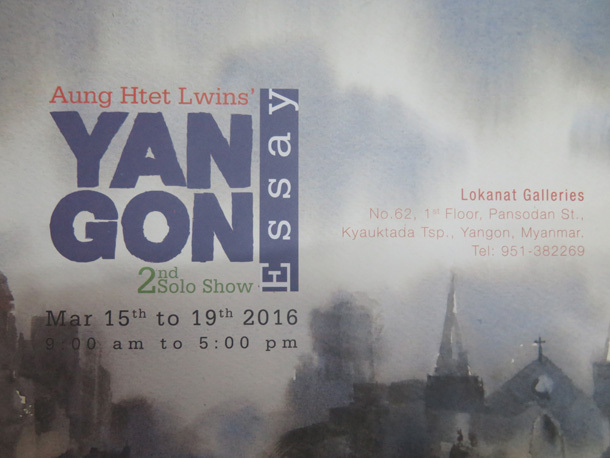 Artist Aung Htet Lwin’s second solo show, titled “Yangon Essay” will feature scenes from Yangon’s urban landscape. A total of 36 paintings will be displayed. Prices range from US$50 to $500. 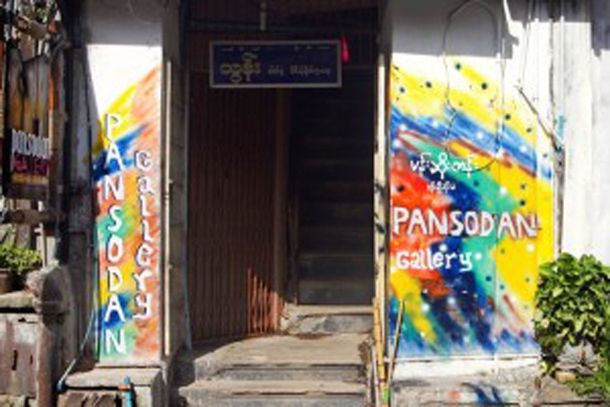 Every Tuesday evening, Pansodan Gallery opens up for a gathering in which all sorts of people interested in the future of the country enjoy conversation and perhaps some beer until late at night. Guitars generally come out after midnight. When: Every Tuesday evening. Time: From 8:00 pm onwards. 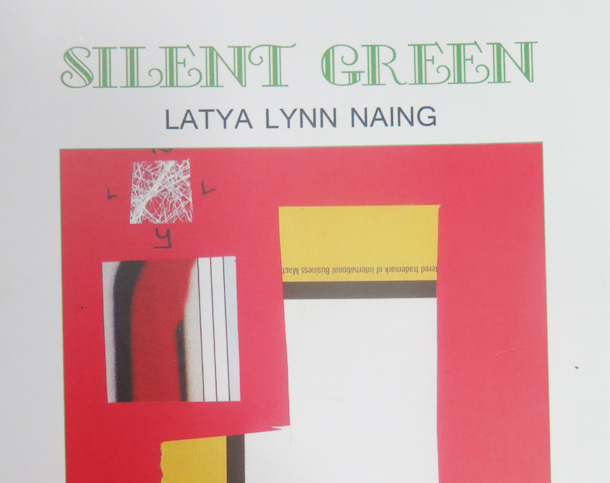 Artist Latya Lynn Naing will stage his third solo show of collage works. A total of 61 works will be shown, with prices ranging from US$15 to US$20. When: Saturday, March 19 to Wednesday, March 23. Time: 9:00 am – 5:00 pm. “Totally Wired & Dalla Days” is a double exhibition of mythical sculptures and environmental portraits by Don Wright. The photographs were taken in Yaza Thingyan Ya Kwet in Dala Township. All profits from the sale of photographs and a percentage of the sale of the sculptures will go towards supplying water containers and mosquito nets to residents. 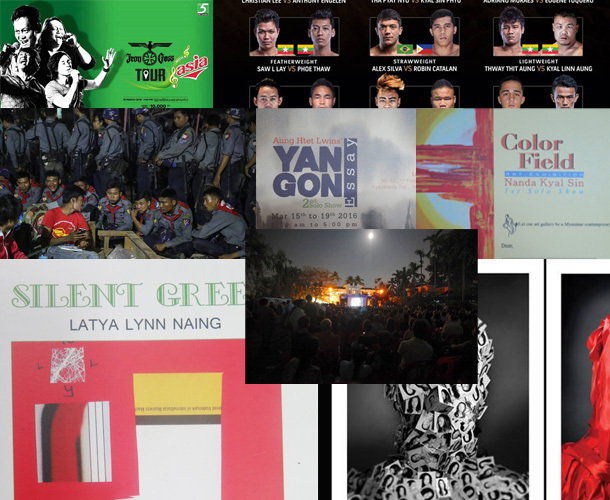 Where: Gallery 65, at 65 Yaw Min Gyi St, Dagon Tsp. 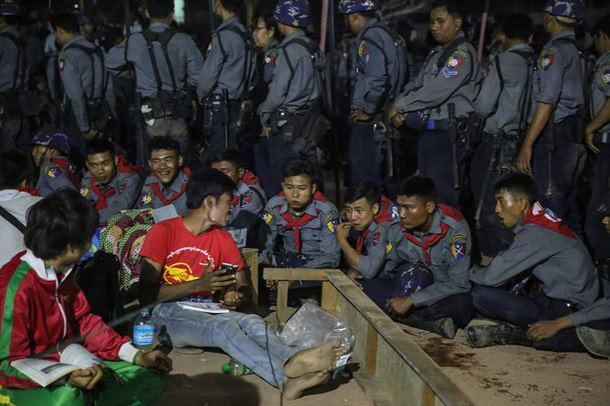 Looking back: Photographers Sai Zaw, Htoo Tay Zar, Hein Htet, J Paing, Soe Zeya Tun and Thet Htoo documented student demonstrations against the National Education Law and the subsequent police crackdown during March 2015. Where: Myanmar Deitta. 49, 44th St. When: Monday, March 14 to Thursday, March 31.